The larvae of this species feed on species of the Flacourtiaceae particularly Scolopia. Mature larvae have a dull green body mottled with grey, a yellow lateral line and numerous dark branched spines; head orange-yellow with 2 black spots. 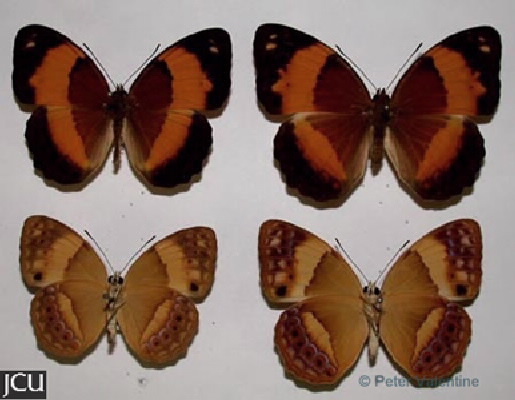 Adults on the upper surface are brown near the base then a broad orange band and then a dark brown-blue area with 2 pale subterminal spots, hind has some darker spots. Lower surface is dull yellowish-brown with a dull yellow median band, in subterminal area are some black spots edged in orange.